Comet joined ARK last year in September. 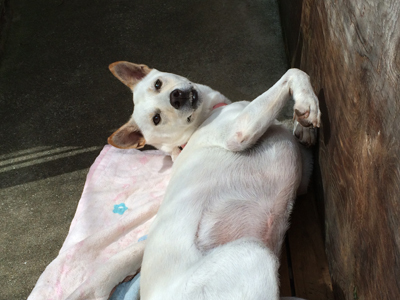 She was found in a shack down a hiking trail, extremely thin and taking care of five pups. Even though it had been impossible to catch her without using traps, she turned out to be a very peaceful and friendly girl once with us. Comet raising her pups, and always tired. Her kids are also growing very healthily, neutering and spaying went very smoothly, and next on the schedule is the spaying of the mother. Being such a nice family we thought they would find new parents pretty easily, but for whatever reason they never get chosen even though we have introduced them again and again. They are clean, the don’t pull on their leach during walks, they never bark, they are probably among the easiest dogs to have... but unfortunately, everyone seems to get the impressions that they have no spirit. Even though her pups have grown, she still has those tired eyes. Well for sure, their mother is always like that, very soft. But when she gets to it, she can also turn into this! She would be the perfect match for someone who wants to enjoy a drink in the sun! 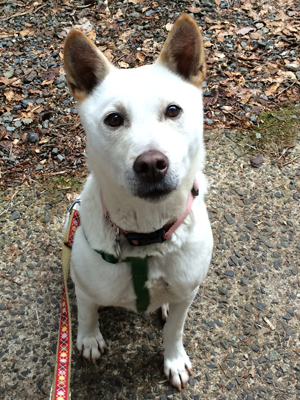 Dogs like her are very rare... Hopefully spring will bring her luck! 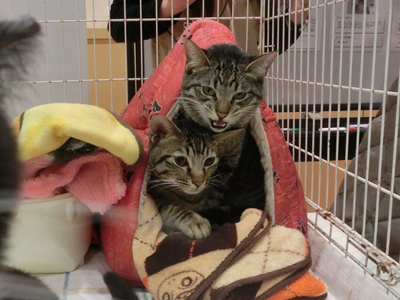 We introduced you to Chimney and Candle in our previous Foster News report. 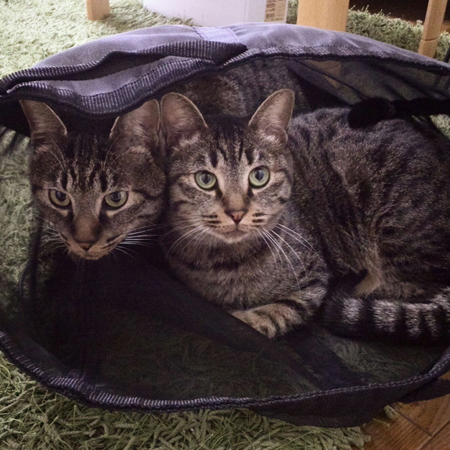 In fact, there is another team of tabbies in Tokyo, P.G. and Nadeshiko. 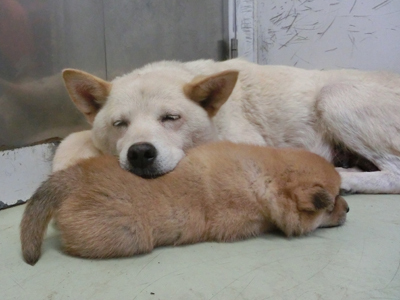 The two of them have gotten used to their foster’s house and now the time to seriously look for a new family has come! Let’s take a look at Team Tabby Part 2! 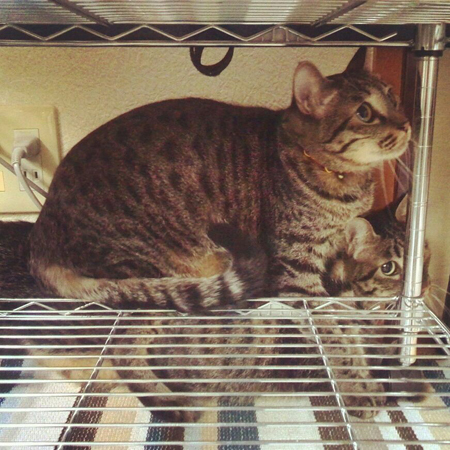 When they moved to my house in September, both of them came out of their cage very timidly. P.G. 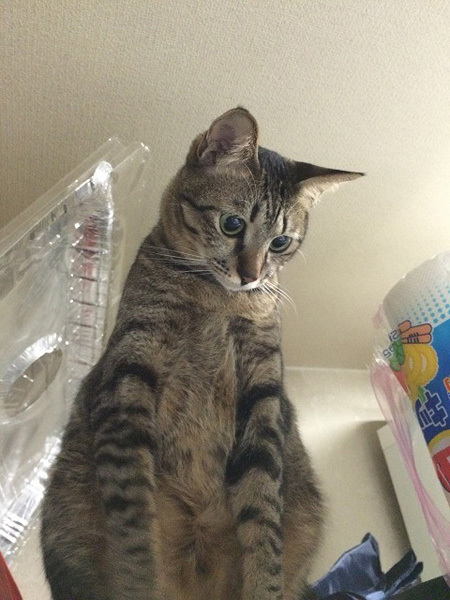 fled under the bed, Nadeshiko ran to the kitchen and strangely decided to climb and hide on the kitchen stove, just to be caught again by the ARK staff. Thinking about it now, at that time they showed me their personality in a way that was very easy to understand. The first couple of days were... strange...? But when you looked around, it was totally quiet, and the only way to get a little relieved was to see that food bowls were getting empty. Being the first time for me to become a foster, I was extremely worried to see them so scared. Getting slowly closer day by day, it was as their previous foster had told me, and after a couple of weeks they turned into very affectionate cats. Now my daily life is much more soothing thanks to these two sweethearts. Always doing things at his own pace, always hungry, but never angry. P.G. usually loses against Nadeshiko, except when it’s food time. He rarely jumps on people’s lap, but he will always round himself very close to you, as if waiting to be petted. 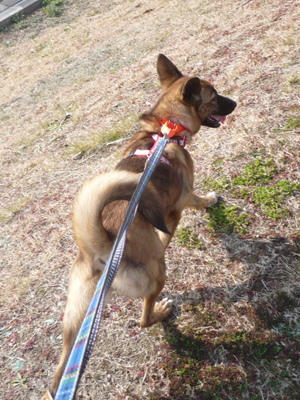 When people he does not know come by, he usually looks from far away at what Nadeshiko does before coming along. 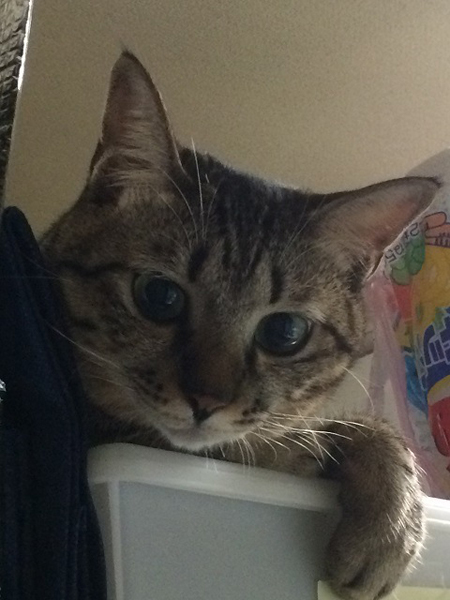 He almost never shows his claws or attacks others, usually running away if he does not like something. He is also very patient when getting his claws cut! Never starting a fight, he really is a soft and gentle boy. With little things like that, he will give you a lot of love and you will never get tired of his company. Nadeshiko’s particular way of crying is a sign of her good moods. She loves speaking, and as she remembers her name, it feels like you are having a real conversation. She may be scared at first, but she really likes people and once she gets used to you, she will be all meow-meow purr-purr. 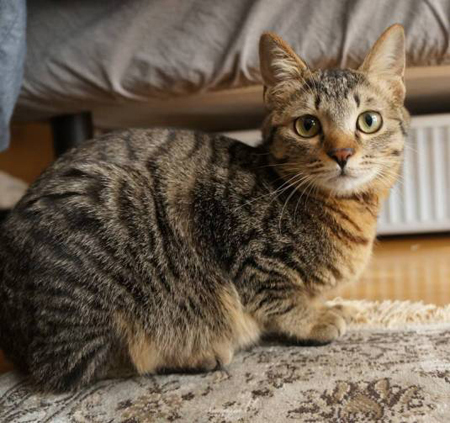 She is not capricious at all, and when you move toward a table, she will go purr either on your lap or squeeze herself between you and the backrest of the chair. She can be really cute when she comes to steal the attention while you are minding your own things. She is always careful to trim herself neatly, her biggest pride being her nicely polished claws! But when I cut her claws, she usually ignores me for a while. She may be the youngest, but she behaves more like the older one, always very accommodating. They are a really cute pair! 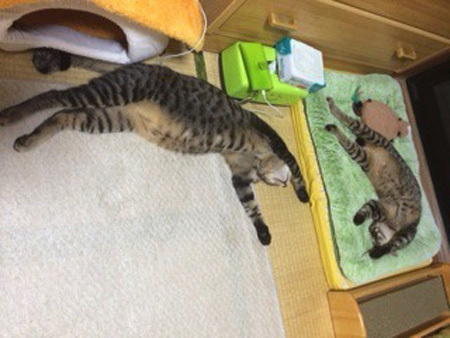 In Tokyo there are no shelters, but we can get a taste of their daily life in their foster’s house. 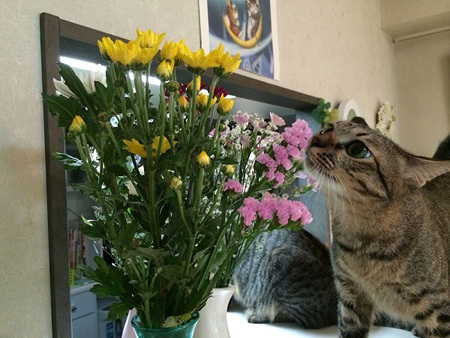 Many people have the wrong impression that mature cats are not friendly, but that is totally untrue! 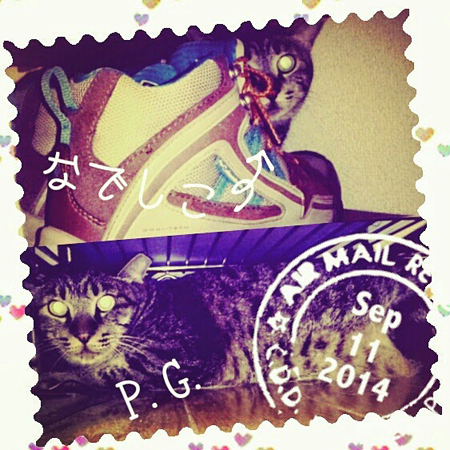 Even cats like P.G. and Nadeshiko who tend to hide at first, only need some time to accommodate themselves to their new environment! A very interesting Tabby Team. 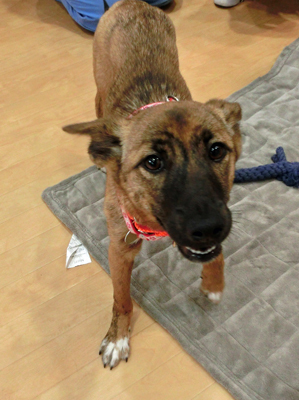 We are always looking for new fosters as well! 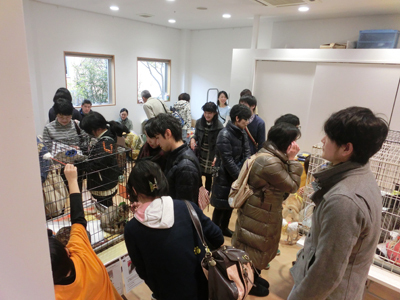 On February 22nd, Japan’s Cat Day, we had our “Adoption Event: Full of cats” at our usual place, Kobe Green Dog. Thanks to so many people sharing the news, we had quite a lot of phone calls before the event itself, and it turned out to be an even greater success than we could have imagined. Cappe, one of the “winners” this time. This is Shirasu. She was in the same spot the entire time, very nervous. The dog team kind of played the supporting role this time. In the end, out of our 11 cats, 6 found a new home!! Moreover, many people said they would come to visit ARK on the next day. 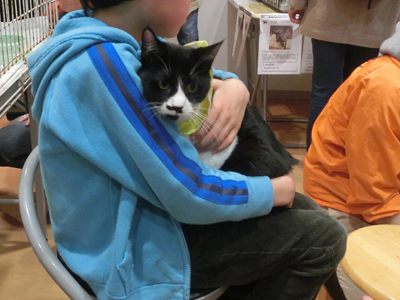 We are hoping to hold more adoption events “full of cats”!! Please come and spend some time playing with them if you can!! Thank you to everyone at GREEN DOG SQUARE for letting us use some of your space this time again! 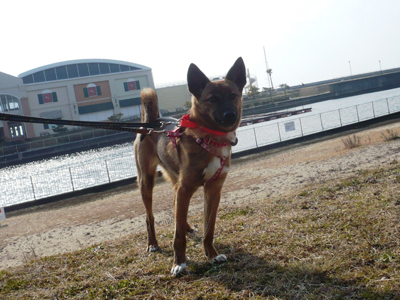 Our next adoption event in Kobe will be on Sunday, March 29th. Come spend some time playing with our boys and girls! There are many other boys and girls waiting for their new home! There is no ARK shelter in Tokyo. Animals who have been rescued are in the hands of “fosters”, and temporarily live with their family until they find their own adoptive parents. 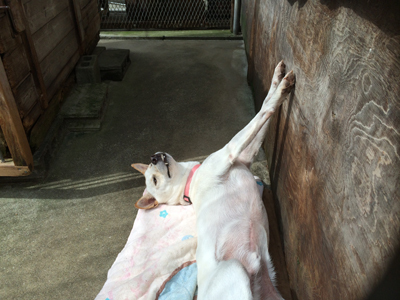 Fosters are most essential to Tokyo ARK, being the only hope for many animals. 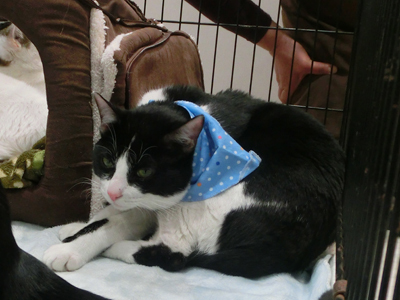 Chimney and Candle were originally rescued in Osaka. 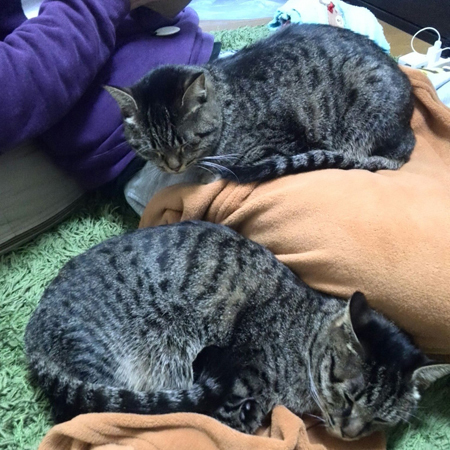 The siblings were rehomed in Tokyo once, but as they could not get along well with the other cat living there, they had to come back to us. 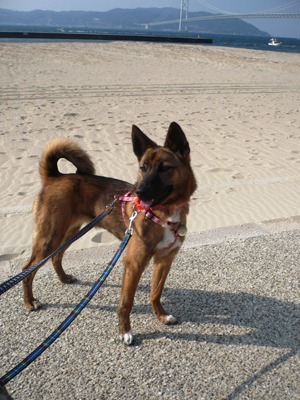 As they can have a hard time getting used to new environments, it is difficult for them to take part in our adoption events, and thus promoting them to potential new families is a problem. Let’s take a look at how they have changed in the foster’s house, and introduce you to their charms! Chimney and Candle made their way here in the ARK car. That was already 8 months ago. Having lost my two cats just before that time, Chimney and Candle brought me a lot of strength. I hope they can find their own happiness very soon. They were little and hid behind the TV and under the table at first, but they soon came out to go on adventures around the house, and following their own curiosity, they kept playing around with toys. 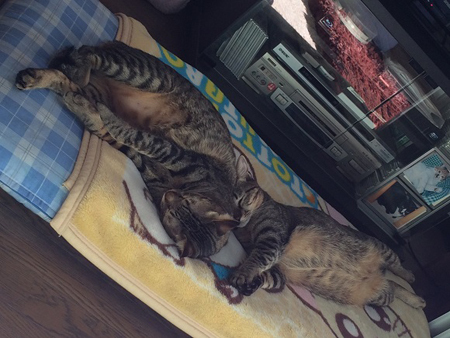 Probably very tired, they spent their first night sleeping on their back. 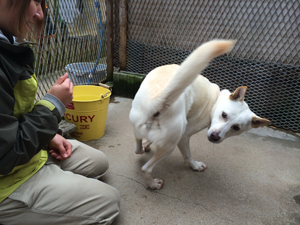 Candle, with her very cute tail, is very active and has great jumping abilities. 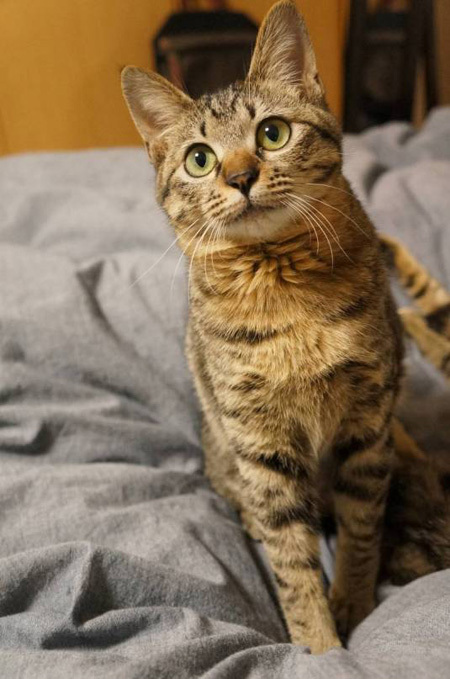 She cries a lot, whether to play, beg for food, or even after she went to her litter box. She is a very clever one, and sometimes may slightly bite you to play. 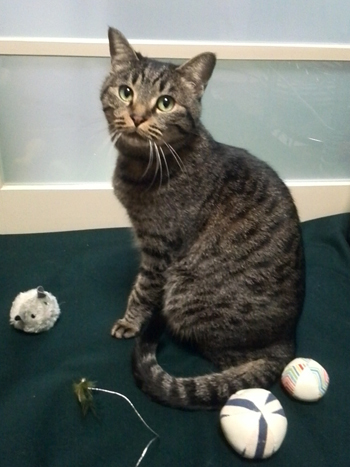 She has a tough side as well, but if you call her name, she will purr, start kneading, and wait for you to pet her. She also always sees me off all the way to the door when I leave the house. 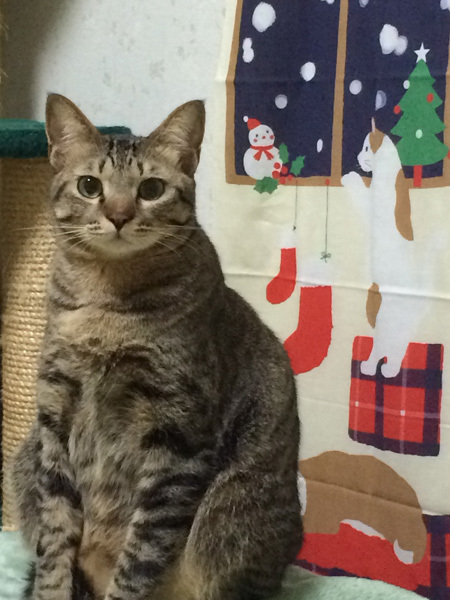 Chimney is a very handsome boy, like an actor. He can be shy, but still, since the first night here, he often comes next to me and cries to get petted. If you pet him softly, he will close his eyes and start purring of pleasure. He always comes to comfort me when I think of my cats who just passed away and cry... He is a very kind boy. 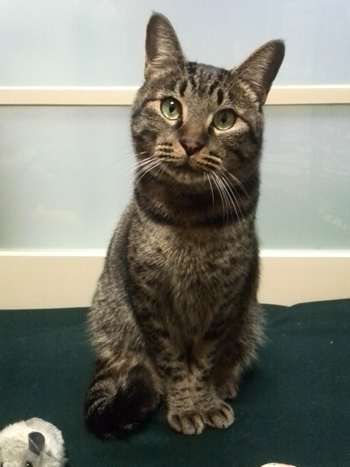 He is very sweet and loves to be petted, but still quite shy, he does not like being held. He also likes to play a lot. If I praise Candle for jumping so high so many times, Chimney will accept the challenge and start jumping around like his sister. His face showing that he, too, can do it, is the cutest. If Chimney gets petted, next Candle comes and cries to get petted as well. Of course Chimney will come back next to me with his eyes closed to get more, but when I reach to pet him, this time it is Candle who takes the petting role and start grooming her brother. It is a very funny sight! 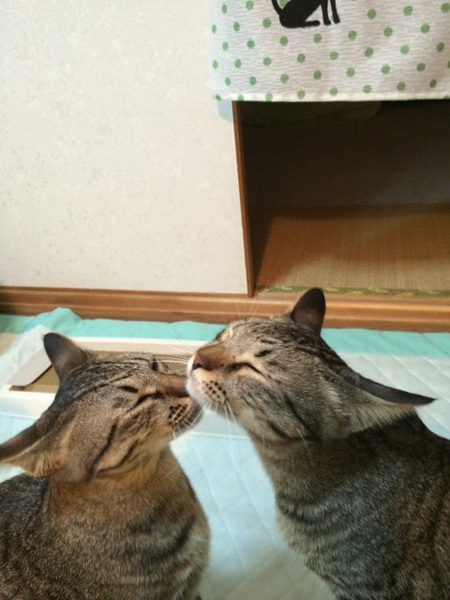 They both have a lot of power, pushing things off shelves, messing with tissues and toilet paper, destroying boxes and paper bags, doing the usual mischiefs that cats do on a daily basis, and then one day you funnily realize that cleaning their mess also helps you clean the house. The extremely messy room turns into a very clean room. I get more positive and tend to forgive them anything when I look at them innocently sleeping. They have very different personalities, but get along really well. I hope we can get them rehomed together. You will have the privilege to see Candle jump when she wants some food. You will be able to appreciate all of that with Chimney who loves watching Cat-TV. Thank you for this message showing us all of their charms! 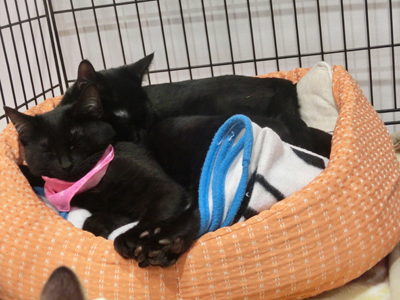 Of course you can adopt a single animal at ARK, but we often recommend to adopt pairs at the same time. Even if the house is often empty, it will give them plenty of play time, and will help young ones get socialized by older cats. To you two, learning and spending your days in your foster’s house. Thank you so much for sending us so many cute pictures! 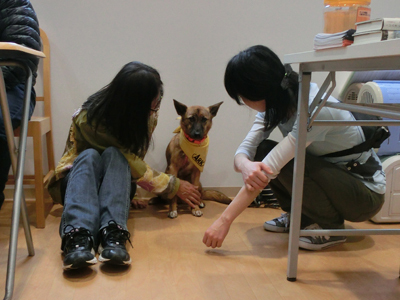 Lacking a regular shelter in Tokyo, we usually rely on fosters to help us, and in Osaka we occasionally ask for their help with boys and girls who need special socializing, being scared or for many other reasons. 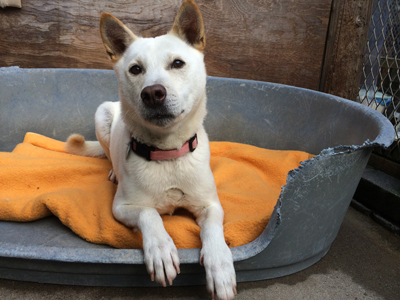 At the moment, the 7-month-old Koimo is learning in one of our foster’s home. 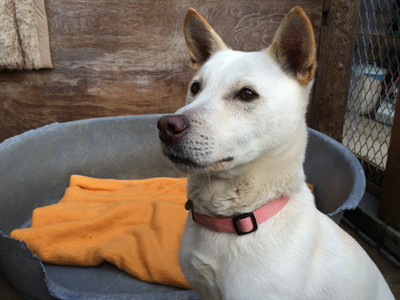 Her mother having spent most of her life wandering, Koimo has learnt to be cautious, and lacking any kind of aggressivity, she usually ran and hid in her kennel as soon as she saw someone walking around. 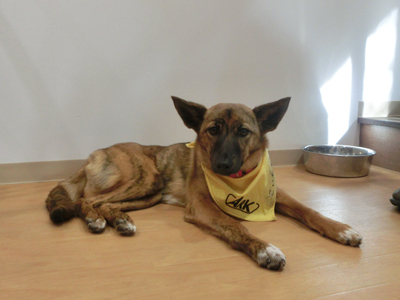 Let’s take a look at her after two months with her foster family. 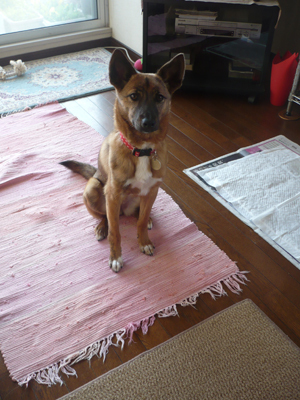 In December of last year, Koimo entered the house, crouching, making herself as small as possible and shaking all around. After two weeks, the only time when communication with Koimo was possible was when giving her food. 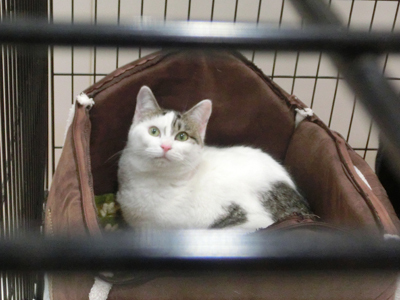 Even though she was picking food from people’s hand, every day was spent worrying, looking at her and hoping she would get used to her new surroundings, hoping she would open one day. 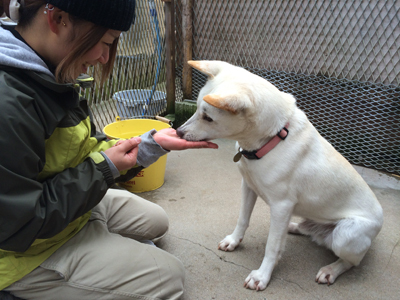 Physically close, but far at the same time, it slowly became possible to pet Koimo, she slowly understood how good it was to be petted, and started to progress on her way to socialization. 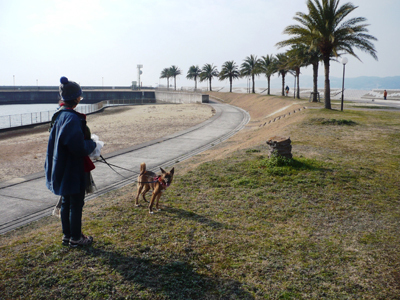 The biggest change happened during the New-Year holiday, when relatives came with their dog. 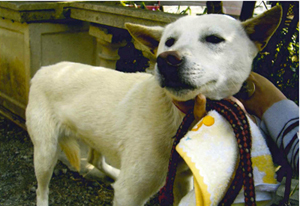 It was an older dog who did not try to play or anything, but maybe because of his presence, Koimo was able to relax among strangers, was nicely petted by everyone, and even though everybody was worried for her at first, she was able to spend a nice New-Year holiday with family and relatives. Since then, she only comes inside the house to sleep. 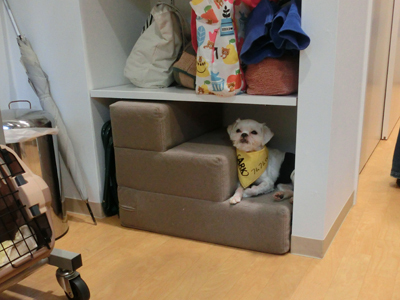 She got used to her new environment and started to change more quickly. 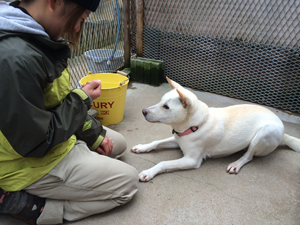 Maybe she recalled what she had been taught at ARK and started to sit down and wait before getting her food, and even showed pleasure and affection by licking faces when people came back home. It feels really great to see such changes when we remember how she was two months ago. 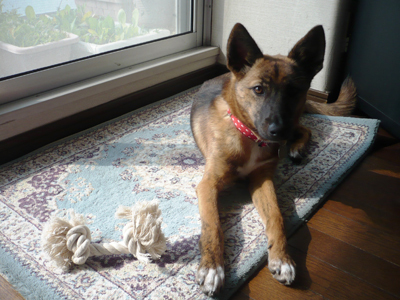 At home, she gathers her toys in front of the window. Sitting and patiently waiting when food time is getting closer. She really loves going for walks. But for the cowardly Koimo, even the entrance of the park was a tough challenge. That too, is slowly getting overcome. 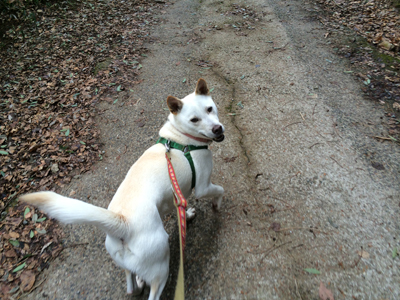 Like every puppy, the first thing she wants to do is run like crazy! Being scared of everything, she needs to get used to walk with people, and so spends most of her days learning from them. A very gallant young lady. It can take some time to get used to a new environment for boys and girls who get easily scared, but once it’s done, they get strongly attached to their family and will be extremely affectionate. 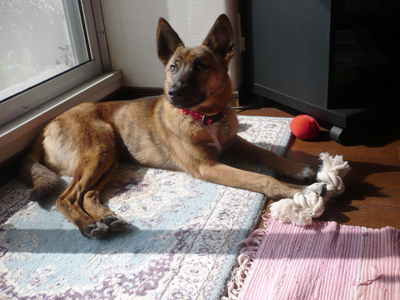 Still, even though she turned 7 months old, she still weighs less than 10 kilos, and being in the “little pea” size range, she would perfectly fit life in an apartment building with size restrictions. She is very docile and is even able to use pet-sheets as toilet if necessary. 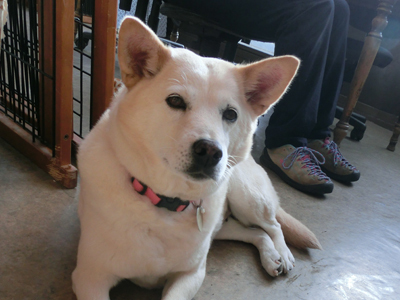 Koimo is now taking part in our monthly foster family event at Kobe Green Dog. Next time on the 22nd of February will be Koimo’s third time. 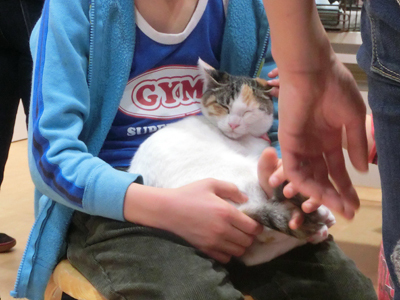 It will be one of Japan’s Cats Days, so please come visit Koimo with her two other canine and ten feline friends! Astro joined ARK in March 2009, almost 6 years ago. Probably abandoned, someone who had seen him walk around the streets heard he had been taken by the public health center. This someone went all the way to the health center to pick him up, and took him to ARK instead. 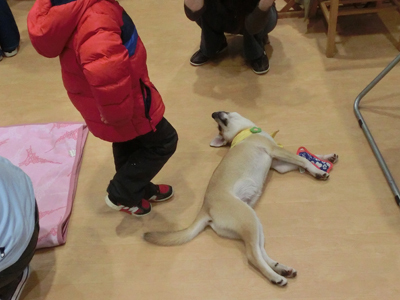 At that time, Astro was still very small and very friendly with people, and we thought he would be adopted quickly. Astro at his arrival at ARK. He was very thin and still had his puppy face. He loves people, but can still be a little scared, and he is so happy when people step in his kennel that he will jump, softly play-bite, pull (and sometimes tear...) your clothes... Such a daily life-style turned him into a beautiful and muscular middle-aged dog. Astro is a “good guy”. 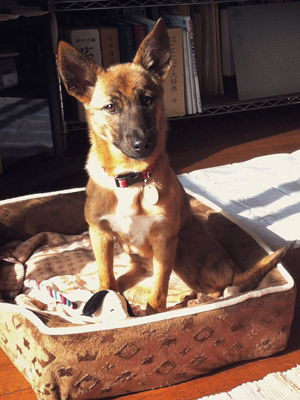 Even after many introductions to new parents, he still remains without a new home. Is it because of his horse face? Is it because of his fox eyes?? A walk-lover, he always cries in a surprisingly cute voice when he sees the volunteers getting ready to walk dogs around, and patiently waits for his turn. 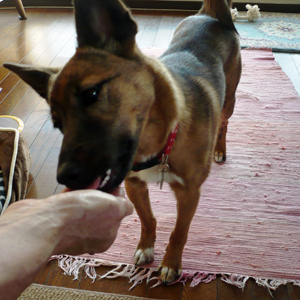 And of course, when his turn comes he is so happy that he pulls like crazy, but will pay serious attention to you and walk more nicely if there are some treats. He is also a very talented entertainer. Of course he will sit, lie down, give you his paw and wait for you, but also turn around in circles. He is a very good partner, and will perform for you as long as there are treats waiting. Have fun watching this video of Astro performing for you. 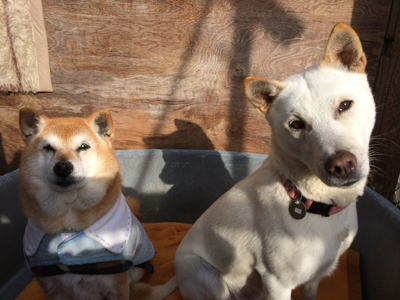 Astro has been in charge of young puppies countless times before, and it would be nice if he was able to have a good time with his current Shiba Inu roommate Mizuki... but in fact, Mizuki is a very capricious young lady. 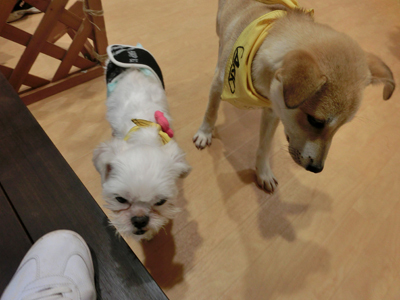 Our gentleman Astro will never complain when Mizuki keeps the toys all for herself. They use the same bed, but still keep their distance. We understand he is always restraining himself for her, but when we see him able to use all of the bed for himself alone, it makes us wish he could do the same in his own new home as early as possible. He may not be the most handsome, but he is very gentle and a very “nice guy”. The heart matters more than the looks when you are looking for a partner for life. Maybe you could start with his “Chin”?